There are no headstones at Wirra Wonga natural burial ground in Adelaide. Photo: Don Brice. Arun Ramchand hears first-hand the many reasons people opt for natural burials within a cemetery. Recently, one story stood out. The community engagement consultant with Adelaide Cemeteries Authority was touched to hear a widow explain why her husband wanted to be buried in the bush, without a headstone. “The lady said he was always an angel at heart and he wanted a natural burial so that in two or three years he would be back into the earth and someone else could use the site,” Mr Ramchand says. Mr Ramchand says concern for future generations and the environment are key motivators for people opting for a natural burial. He works with people contemplating being laid to rest in either of Adelaide’s two natural burial grounds, which are named in honour of traditional owners, the Kaurna people. Wirra Wonga (bush grave) and Pilyu Yarta (peaceful ground) are cemeteries distinguished by trees and native shrubs, rather than headstones, manicured gardens and ordered pathways. As with other natural burial cemeteries, there are strict guidelines covering how bodies are buried there. Bodies cannot be embalmed and must be placed in either shrouds of natural fabric or biodegradable coffins. Ashes must be placed in biodegradable containers. There are no headstones. Grave locations are recorded and can be tracked, but the site is returned to a natural bush state. Mr Ramchand says many baby boomers are keen on the concept, with one commenting, “We like to be defiant in anything we do, even when we choose our final resting place”. Multiculturalism is having an impact on take-up too, with both Jewish and Muslim communities finding that – with some minor adjustments – natural burials fit with their cultural beliefs. Mr Ramchand says Adelaide Cemeteries Authority’s natural burial sites cost less than traditional burial sites (a 99 year lease on a natural burial site is $5000 compared with $8500 for a lawn burial at Enfield Memorial Park). While sceptics have expressed concern about being “tossed into some dirty, muddy corner and forgotten” Mr Ramchand says their fears typically disappear once they’ve seen the natural sites for themselves. “Wirra Wonga gives you a sense of openness and feels a lot better to a lot of people. They take a liking to it almost immediately. When families go there, 95% find peace instantly and the fears they had suddenly disappear,” he says. Natural burials, however, are not an appealing option for everyone, or the only way to go green. Janet Miller, CEO of Centennial Park cemetery in Adelaide, says about 80% of Australians opt for cremation, rather than any form of burial and that natural burials are “an emerging trend”. “We don’t have statistics on natural burials, but the concept has been around for a long time and overseas the take-up has been greater in Australia,” Ms Miller says. She says the term ‘natural burial’ means different things to different people. While it was possible Centennial Park, Adelaide’s largest cemetery, would start offering them in some form in the future, it wasn’t yet clear what they would look like. “Before we shore up formal plans we are doing a lot of research and community engagement work to see what people mean exactly by natural burial. At this stage, Centennial Park is doing the right thing by the environment in other ways. Ms Miller says it was the first cemetery in Australia to manage its greenhouse gas emissions by purchasing carbon offset units. Its efforts to minimise environmental impact have been recognised twice by the United Nations Association of Australia’s World Environment Day Awards, both as a winner and finalist. In 2008 Centennial Park conducted research which found – somewhat surprisingly – that cremations had less impact on the environment than traditional burials. Ms Miller says cremation produces 160kg of carbon dioxide, which is nearly four times that produced by a burial. However, the long-term impact of watering and mowing a traditional gravesite means that “cremations are definitely more environmentally friendly than a standard burial over the long term”. While the cemetery hasn’t undertaken equivalent research in terms of natural burials, “I think we can safely assume a natural burial would be more environmentally friendly than a cremation,” she says. A desire to minimise environmental impact, simplify burials and reduce their cost motivated a contingent of Victorian farmers to establish a more unorthodox form of natural burials, where bodies are buried standing upright, without a coffin. Upright Burials managing director Tony Dupleix says the first person was buried upright in Kurweeton Road Cemetry in 2010. It has been slow to take off, but now 35 people have been buried in the grassland cemetery and about 100 have prepaid to secure a spot. The graves are unmarked, but small plaque with the deceased’s details features on a memorial wall. The trust which administers the site may add GPS tracking at a later stage. Mr Dupleix says the decision to bury people standing upright evolved from assessing each part of the standard burial process and determining what was necessary and what could be simplified or cut out. It turned out that digging deep cylindrical holes with an auger was safer and cheaper than a traditional grave. He says the deceased is gently lowered into the hole and “there is no thump”. The body leans against the side of the hole, which is then filled with soil. Bodies are not embalmed, to ensure chemicals like formaldehyde don’t damage the environment. Instead, corpses are kept in a cooling facility about 10km from the cemetery and may be frozen, in rare instances when they need to be transported or kept for some time. They are wrapped in hessian treated with corn starch, which Mr Dupleix likens to a giant sleeping bag, and then in a hessian shroud. Mr Dupleix says the bodies release less methane as they decompose compared to those buried in a coffin. “If you’re buried in contact with the soil in decomposing fabric, as you are with an upright burial, the body dries out much more quickly. Because the soil microbes take out the nutrients more quickly, you have less gas and less ground water contamination. In keeping with the environmental prerogatives, a tree is planted on nearby Mt Elephant for each burial, supporting a reforestation initiative. The burials, all for perpetuity, cost $3250 for people in the Melbourne metropolitan area or western Victoria. 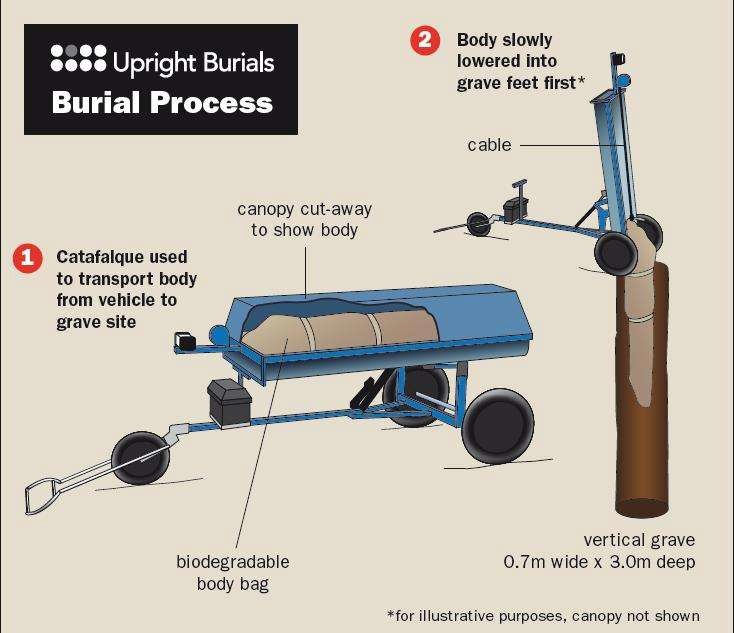 Bodies can also be transported from other states in order to be buried upright, but this of course increases the burial’s carbon footprint and costs more. Speaking with one client from Adelaide who was determined to have an environmentally sound burial, Mr Dupleix raised the environmental cost of him being transported interstate. Mr Dupleix says while upright burials are cost effective, environmental concerns remain the primary motivator for clients opting for them. Many also are disenfranchised with traditional options. Only one burial has been attended by a religious leader. “One interesting thing which I didn’t expect is most of my inquiries have come from women,” he says. He says they have generally outlived their husbands and with hindsight, were disappointed with the funerals they had organised. Mr Dupleix says he didn’t expect many burials to be attended by friends and family, but 19 of the last 20 burials have been. “They are very powerful little moments,” he says. Mr Dupleix says when it comes to his own burial, the decision is “dead easy”. “I’d certainly want an upright burial. I just really like the idea. “I’m hoping there will be some degree of a loud and long-lasting celebration after I’m gone, but I don’t need headstones and monuments and rubbish like that. People can be buried in a shroud or biodegradable casket at the 3.5ha Wirra Wonga burial area at Enfield Memorial Park. Wirra Wonga is the local Aboriginal name for bush grave. Cremated remains must be placed in biodegradable containers. While there are no headstones, grave locations are recorded, and there is a communal memorial at the burial ground’s entrance. Mourners can assist with backfilling the grave. Natural burials are also an option at the Pilyu Yarta burial area of Smithfield Memorial Park. Pilyu Yarta, which means peaceful ground, offers unmarked sites that are micro-chipped to ensure burial sites can be found. Remains are buried in biodegradable casket or shroud. Freemantle Cemetery offers natural burials among the native plants of Pinnaroo Valley Memorial Park. Grave sites are unmarked but are mapped. Bodies cannot be prepared with chemicals and coffins must be made of biodegradable and not have synthetic materials. The Bushland Cemetery is located in Lismore Memorial Gardens, where the gum trees are important habitat for koalas. Bodies can be buried in coffins made of organic material, or in shrouds of biodegradable cotton. However, permission to be buried without a coffin requires formal exemption to be granted by the NSW Department of Health. BushLand Cemetery staff assist with this process. At the Bushland Cemetery, graves can be marked with a monument stone obtained from a local quarry, with a cast bronze plaque. The Greater Metropolitan Cemetries Trust offers natural burials at both Lilydale Memorial Park and Healesville Cemetery. Bodies are not embalmed and can be wrapped in a shroud or placed in a coffin made of recycled materials, cardboard or untreated timber. Kurweeton Road Cemetery is located in the Corangamite Shire, north-west of Warnambool. The cemetery is dedicated to upright burials. The cemetery is pastoral land and has no headstones or grave markers. Next of kin receive an exact location of the grave site and details of the deceased feature on a plaque at the cemetery entrance. There is a 1ha natural burial ground in a bush setting with brittle gum and yellow box trees at Gungahlin Cemetery. Natural burial grave sites can be located using a map and GPS. A radio frequency identification device is also placed underground beside the grave. Plaques are located in a communal memorialisation space. Ashes can be scattered or buried at the site but their location is not recorded. Kingston Cemetery, just south of Hobart, has a bushland burial site. Graves are marked with a bush rock with the deceased’s name, which also features on a plaque at the burial site’s entrance. Coffins must be fully biodegradable, solid, untreated and unpainted timber. Sydney Natural Burial Park is located at Kemps Creek and offers Sydney’s only eco-burial lawn. To ensure the habitat us kept as natural as possible, there are no formal headstones or monuments. Right of burial is granted for 30 years, and can be renewed on expiry. Natural burial graves are intended for two burials and include inscription upon a communal sunstone memorial. A fantastic article, thank you. The social and economic impact of the gas that fuels cremation should also be taken into account when comparing burial v cremation. Fueling a cremation chamber for around 90 minutes at approx 900 degrees Celsius takes a lot of gas. Considering the current controversy surrounding gas extraction in Australia, and talk of a looming gas shortage leading to higher prices, the effects on crematoriums is yet to be realised.